The oldest pool on the fishery, with really dark coloured wild carp, they are the biggest and the hardest fighting at the fishery. The pool is also stocked with bream, rudd and cruicans. 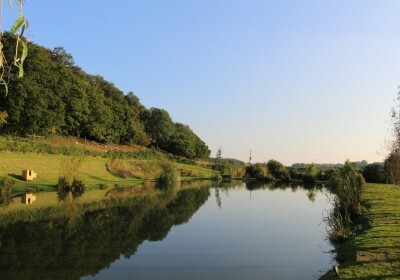 The Duck Pool probably produces 3-4 different methods of fishing, from up in the water at 13.5 metres to waggler fishing to the island along with deep and shallow margin fishing. Taking 2 pegs as examples peg 21, fish 16 metres to the island up in the water fishing banded or soft pellet or fish close into the margins on corn or paste, under the willow. Example 2, peg 5, known as the suicide peg and a reputation for breaking sections so be careful. Fish to the left in front of the reeds, be careful when you hook one as they head north to the willow roots! Main baits corn, pellets, paste, worm and casters. 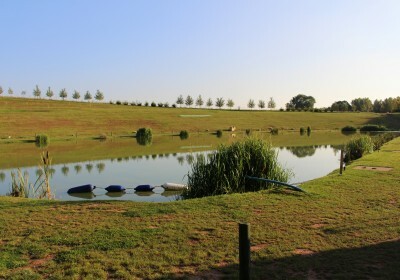 The deepest at 9 feet and the most unpredictable pool on the fishery, a real anglers’ pool!! The pool is well stocked with carp, tench, bream, rudd and roach. The tench and bream running up to 6lb. This pool has a reputation with pleasure anglers that they have to finish by 2’oclock because their arms are aching! The left bank is basin shaped and the dam wall the same; the right bank has a shelf of 4 feet running from pegs 2-7. Main baits are pellet, corn and maggots, fished in the margins. Best tactics depending on the weather are straight out at 11 metres fishing on the deck, coming in to the margins on pegs 2-14 and coming onto 4 metres straight out in front on pegs 15-25. Pegs 30-38 have just been completed. 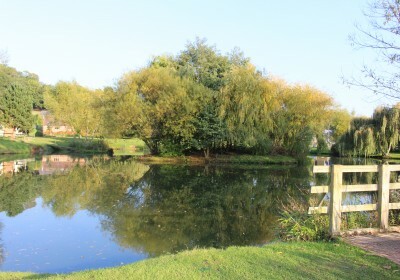 This pool has been stocked with Carp up to 25lb, Bream, Tench and Roach. There are three underwater “sunken islands” down the centre of the pool creating a variety of depths and fish holding features. These should be helpful in the colder months: in the warmer months plenty of fish come from close in. Maggot was the in form bait for the first few matches but pellet and corn now seem to be taking over. 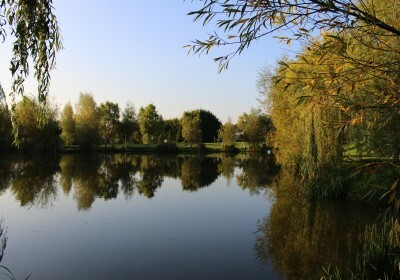 Welcome to the Badger pool…..
Stocked with Carp up to 25lb, Bream, Tench and Roach. Features: two holes approximately 7 feet deep as well as a selection of shelves 3 feet deep around the pool creating a variety of depths and fish holding features. These should be helpful in the colder months; in the warmer months plenty of fish come from close in. Maggot was the in form bait for the first few matches but pellet and corn now seem to be taking over.